Today was planned to be a publishing day, and it has been that, but not only that. We have a door in our dining / living / kitchen area leading outside. It’s where all the neighbor cats come to get love and food. Last night, we heard something at that door and when I went to look, there was a deer looking into our dining room. Deer are not an usual sight here, a forest starts a few meters behind our house and the deer come down from there almost daily. But our neighbor built a fence years ago so the deer couldn’t reach his vegetable garden. Somewhere in the fence there must be a hole so the deer could come down that far. We were worried if he’d find his way back. When I took a coffee break from the publishing work today, there he was again, wandering along the fence searching for the hole, but he couldn’t find it. The neighbor who built the fence and his wife are both deceased and we don’t know if the house has been sold again. So my husband went outside and cut the fence, then we waited until the deer found his way back home and reattached the fence with more wire. The poor guy must be so happy to be with his family again after 24 hours! I think it’s magical that I live in a place where I just have to look out of the window and see deer, and that’s also what links this story to the actual reason I’m writing this blog post today – the publishing of the Last Minute Magic Cowl! Whether you are in need of a last minute gift or looking for some instant gratification knitting, the Last Minute Magic Cowl fits the bill! Knitted in just one skein of a gorgeous, soft yarn made from ecological alpaca, the simple cable and lace pattern is easy to make yet impressive to look at. This design was made for the Artesanitarium Designs Designer Challenge, you can check out all the other awesome designs here. 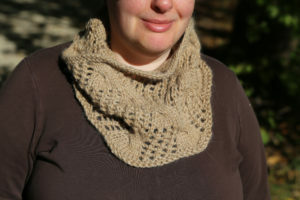 I’ve made my cowl from one skein of Viking of Norway Eco Alpaca – one of my favorite yarns ever. It’s a souvenir from our last holiday in Sweden and I wish I had brought more. The pattern is easily adjustable to any yarn weight and size you desire, instructions for the necessary modifications are included in the pattern.